Hop through the progressive challenges with this wooden puzzle set. 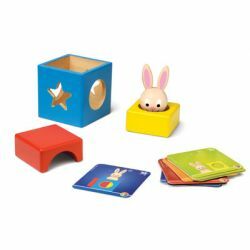 Arrange the four wooden pieces- sweet rabbit, his shapecut hiding cube, a giant yellow nut, and red arch piece, to match the challenge card. Ages 2+.